The streets of Mega-City One are a dark and violent place. In the 22nd Century the rules of society have broken down and a new order has arisen to take control. Enter the Judges - empowered to apprehend miscreants and sentence them on the spot. In a hard world, the Judges have to be harder still. It may be a brutal system but it is the only thing that works. What you will hold in your hands is a collection of lore related to the Justice Department and the citizens it protects - often from themselves. 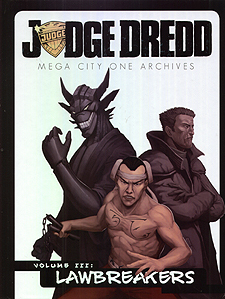 These volumes will detail the world of the Judges as never before - if it drives, shoots, breathes, sprawls or hides in the shadows of Mega-City One, you will find it in this comprehensive collection. Every hero needs a villain, and Mega-City One has had more than its fair share. This tome details the baddest, meanest, and just plain nastiest perps ever to trouble they city, with a complete rendition of their crimes and atrocities. From the Angel Gang to PJ Maybe, Lawbreakers features inside information and glossy artwork throughout.